Brain Harmony is a team of occupational therapists committed to helping families gain individualized, 1-on-1 access to the most powerful and proven therapy to help children and adults with any type of learning and performance difficulty - all from the comfort of their own homes. Licensed nationwide, we deliver a new model of therapy resulting in profound improvement in function for disorders including sensory processing disorder, executive function disorder, learning difficulties, attention and regulation, behavior concerns, autism spectrum disorder, concussion syndrome, depression, PTSD, stroke, brain injury recovery or any type of neurological dysfunction. Confused about the best approach for your child, your family member, or yourself? Looking for that advice on what direction will yield the results you desire? We want to help. Tell us about the barriers you’re facing and we’ll begin to make an assessment on the best approach to break them down. "Brain Harmony is AMAZING! Our son has experienced outstanding (almost unbelievable) progress in their care. They have effectively changed the trajectory of our son's life. As a result, he is a happier, healthier, little man with a very hopeful perspective on his issues. We are immensely grateful and will forever hold Brain Harmony in the highest regard." Cooper struggled at home, on the playground and at school. He was so sensitive to sound that he could not participate in basic childhood activities, like birthday parties. A popped balloon or a neighbor's dog barking would send Cooper into disturbing meltdowns that left him and Mom exhausted. Glenn had 4 strokes that left him unable to do much. His speech had turned to mumbles that were hard to understand, he had become incontinent, drooled constantly and spent most of his time sitting in his chair at home. Brain Harmony approaches therapy for our friends from a holistic perspective. The picture to the right describes it best. The pyramid represents the process of learning for each of us. 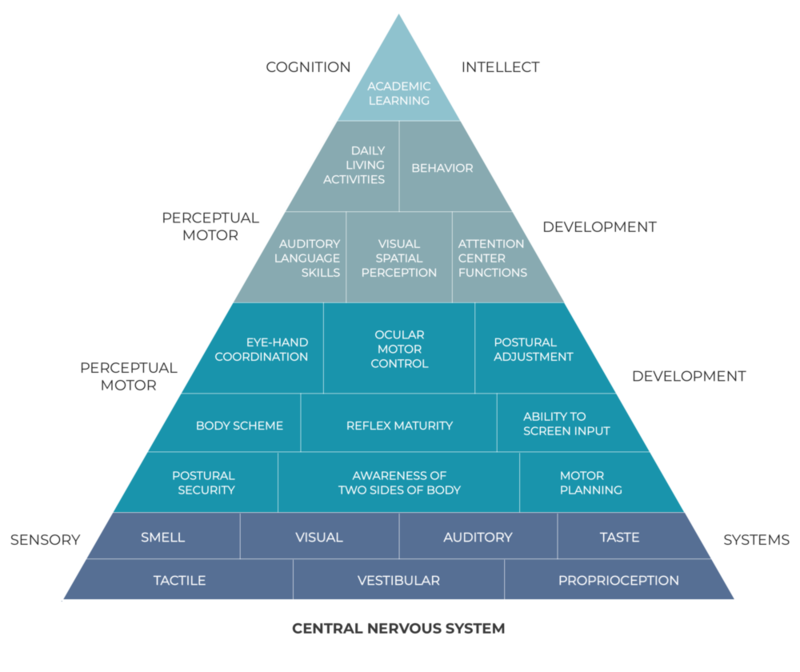 Our senses are the foundation for learning and brain functioning. When any of the building blocks of the central nervous system are not functioning correctly, all other skills that are dependent upon it suffers. Tired of making little to no gains with Traditional Therapy? Contact us today to learn how Brain Harmony can help you.